In the UK we have a scheme that provides those with mobility difficulties accessible and on-street parking. These parking bays are usually wider than average parking spaces, and generally located nearest to a particular building or area of town or city. In light of recent changes to benefits such as the change from Disability Living Allowance (DLA) to Personal Independence Payments, the eligibility to qualify for a Blue Badge has fallen in line with the new stricter criteria. The main eligibility criteria for the Blue Badge is that you need to be in receipt of Higher rate Mobility of DLA, Enhanced and Standard rates of Mobility element of PIP. The government has recently confirmed that from 2019 people with hidden disabilities will be able to apply for the Blue Badge scheme. I noticed about 2-3 weeks before it was time to renew my Blue Badge. It was one of those days that I was attempting to make the most of my hours and phoned from the car while parked outside the GP surgery. From the guidance above, I expected to qualify for the renewal automatically. Not for the council where I live. What transpired next was being asked a number of questions about how far I can walk that were very similar to the PIP assessment. The stress of such previous event brought back some very strong emotions I thought I had dealt with. The situation put me right back in that horrible and terrifying position of wondering if I was going to have taken away one of the tools I use to be independent and move about safely. The call handler was very apologetic; they ask everyone on Standard rate these questions, they said. Surely this is wrong though? Even the council’s policy sets out that a person automatically qualifies if they receive 8 or more points for the mobility element for Personal Independence Payments. All I should have needed to have done was provide my proof of entitlement, the fee of £10 and two passport photos. When I asked if I needed to send the letter in, I was told no, because of the assessment I had been subjected to. The incident was hugely triggering. I ended up crying down the phone. Such is the sadness, fear and frustration that applying for these services induce. It was an immense blow to going through the PIP assessment and no longer qualifying for Motability. Ask any genuine applicant; we don’t want to be applying for these services, we need them to be able to get to the start line your average-height, non-disabled person, takes as a given. The incident has affected my mood too, paired with a couple of health issues, meaning it had dipped considerably, more than I’ve realised. A Blue Badge for someone with dwarfism is not ‘free car-parking’. A Blue Badge for a person with dwarfism equals independence and safety. Where we fall through the cracks of eligibility is that our need for the Blue Badge isn’t intrinsically attached to only how far we can walk. It’s about the physical challenges, distress, and the anxiety we encounter when leave our homes to travel to where we are going. 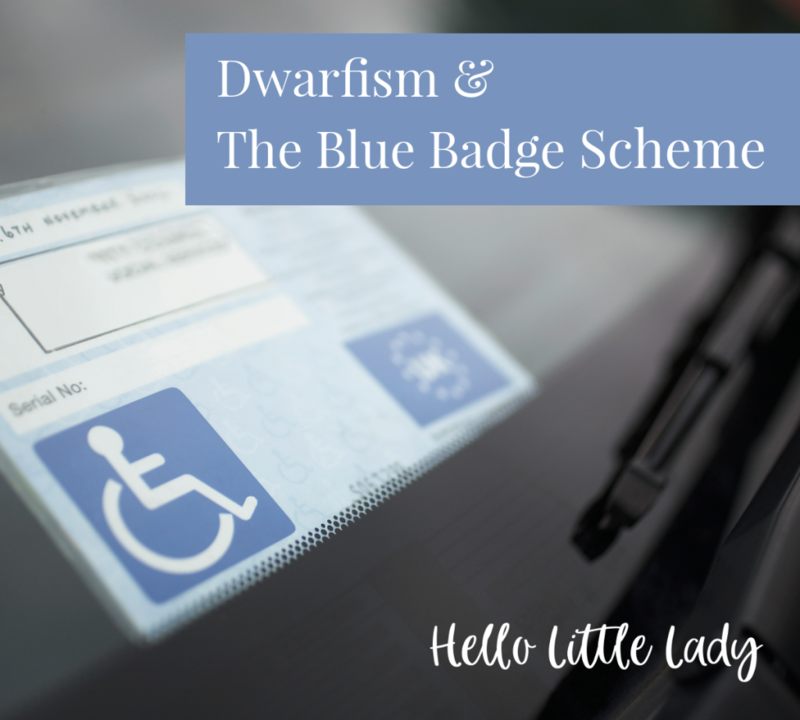 In this respects, the Blue Badge scheme fails to recognise or even acknowledge the challenges people with dwarfism face daily moving about and interacting with our environments and people. We stand at the same height (or even smaller) as an average-height disabled person sat in a wheelchair. Our need for support is not readily as recognised by public organisations, nor the public. From my personal use of the Blue Badge, I see it as a godsend. Move safely from the vehicle. I’ve written about the negative attention people with dwarfism face on a daily basis as we go about our ordinary lives. A Blue Badge reduces the anxiety of having to access services, shops and more. We can park close, nip in and get what we need and be back to the safety of our cars. If there is negative attention – pointing, staring and comments or the chance of assault, we have a safe place to return to, quickly. Imagine being the size of an eight to nine-year-old child, driving up to the petrol station, and being stopped from filling up your car because the petrol attendant has mistaken you for a child. This type of incident has happened to me quite a bit. When I pull up to a forecourt, especially if it’s a petrol station who are not familiar with me, I place the Blue Badge upright on the dashboard to let the attendants know I am a disabled driver. It takes away the embarrassment on the staff side and the stress of looking over to the attendant to get them to see I’m not a juvenile joyrider who’s decided to fill up before taking the car I’ve TWOC ‘d (Taken Without Owner’s Consent for non-Teessider’s) for a spin. A Blue Badge takes some of the anxiety and stresses out of getting where you need to go. It’s almost like a comfort blanket in that respects. It enables us to get close to where we need to be so we can don’t have as far to walk. It also means we don’t have as far to return to our car when carrying bags or pushing a trolley, which takes a lot of energy and a physical toll on our bodies. It allows us to access a ‘safe’ space to move about the environment we are visiting. …and we’re back to how far we can walk. I stand at 4ft 4” (133cm), I even have trouble keeping up with average-heighters who are on the short side. I take about 3 to 4 steps for my husband’s one stride. The distance it takes an average height person to walk, takes me twice the time and effort. I’ve effectively done double the length of a non-disabled person. Can you imagine how tiring this is? How much this influences access to services, shops, education, events and such like? How much planning goes into going out? That’s tiring in itself and a topic for another post In simple terms, my Blue Badge means I can converse energy and use that energy to participate in an activity rather than being exhausted from getting there in the first place. Along with having a car – a blue badge is a tool and service that enables us to be and maintain independence. To not be reliant on friends and family to get around, is a fantastic feeling in itself. Very hard-earned independence at that. For many disabled people, and especially people with dwarfism, mobility is how one navigates the environment as well as how we manage society’s reactions to our disability. It’s about personal safety, to have a space to return to when the anxiety, the crowds or the exhaustion is too much. The eligibility criteria for the Blue Badge scheme needs to recognise this. Guidance on eligibility from .gov.uk (PDF). What have your experiences of applying for the Blue Badge scheme been like? What has being in receipt of a Blue Badge enabled you to do? Share your experiences in the comments below.